Median income is on the rise ... finally! Income is on the rise ... finally! The typical American is finally bringing home a bigger paycheck. 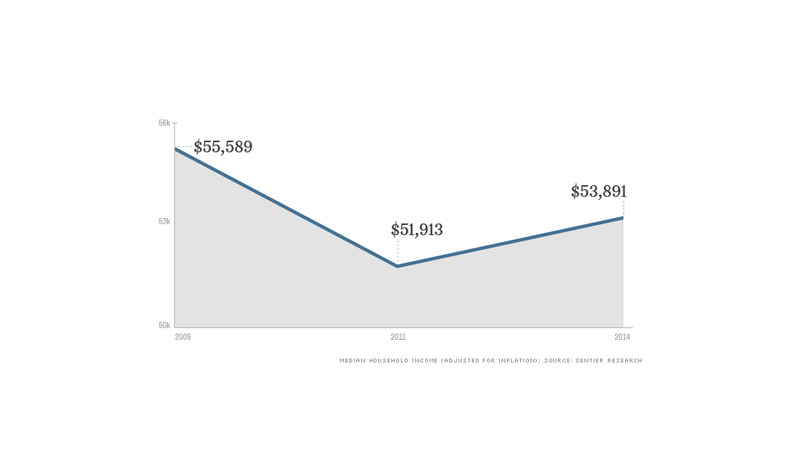 Median household income has been on the rise for the past three years, climbing 3.8% to $53,891 in June, according to newly released data by Sentier Research. It's yet another indication that the economic recovery is taking hold. But Americans have yet to fully heal from the Great Recession, which officially ended five years ago. 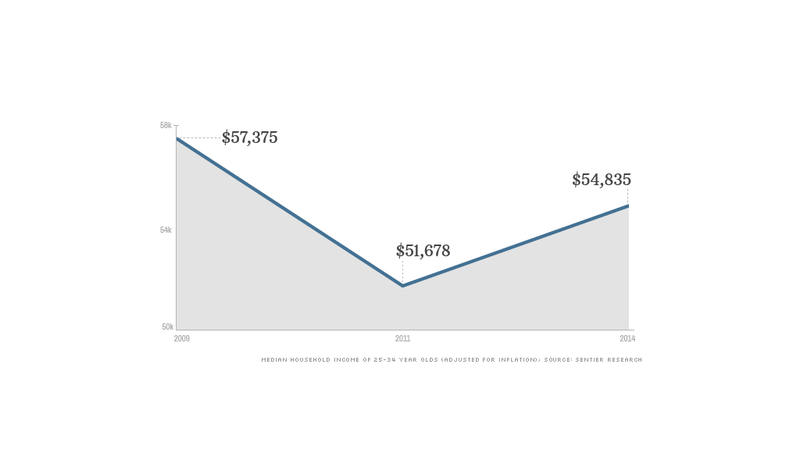 Median income remains 3.1% below its June 2009 level of $55,589. That's in large part because unemployment remained high in the early years of the recovery, according to Sentier. "Even though technically the recovery began in June 2009 ... the broad measures of unemployment were still high," said Gordon Green, a partner at Sentier. "As people found jobs, their incomes went up and then we started to see incomes turn around." Though many people are doing better nowadays, the gains are not spread evenly. Calculator: How close are you to the top 1%? After suffering deep declines early in the recovery, black households have seen their median income rise by 3.5% over the past three years. 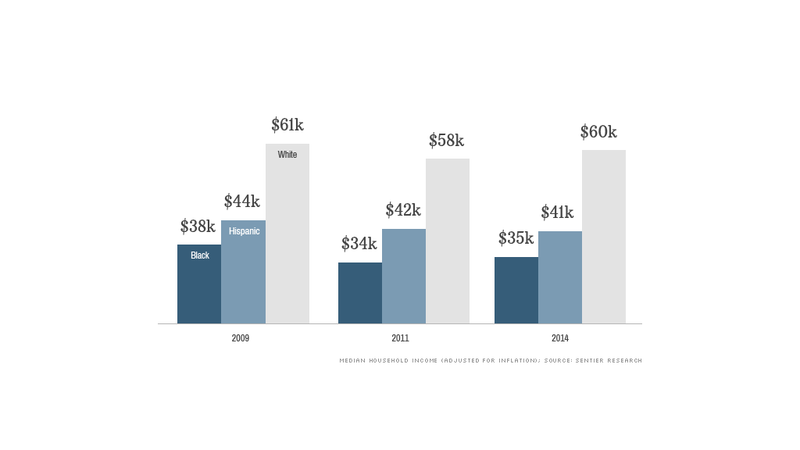 Hispanics, meanwhile, were not as fortunate recently -- their income has remained essentially flat since 2011. Young adults finally saw their incomes rebound strongly in recent years, while others had smaller increases. Looking back five years, only senior citizens have enjoyed a jump in median income, possibly because wealthier Baby Boomers have moved into this age group, according to Sentier. Those approaching retirement experienced the steepest decline, 6.4%, while the median income of workers in their prime, age 35 to 55, slipped between 3.1% and 5.2%. Where one lives also makes a difference. Midwesterns experienced a surge in median income since 2011, boosting them back to pre-recovery level. Southerns' median income, however, is still 6.1% below its June 2009 level, while Northeasterns and Westerns saw their median income slip about 4%. Don't break out the champagne quite yet, though. Americans' median income is still 4.8% lower than it was at the start of the Great Recession in December 2007 and 5.9% below its January 2000 level.